California’s “big three” utilities are taking importa nt steps toward achieving a clean energy future – one in which we will better utilize renewable sources of energy, give customers more choice and control, and keep the state on course to cut pollution. One way they are doing this is through Distribution Resource Plans (DRPs). 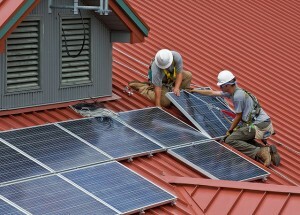 Signed into state law in 2014, DRPs are roadmaps for California’s investor-owned utilities – including Pacific Gas & Electric, Southern California Edison, and San Diego Gas & Electric – to incorporate more distributed energy resources, like rooftop solar and electric vehicles, onto the grid. Each investor-owned utility in California is required to develop a DRP, and the big three submitted their initial plans on July 1, 2015 – a milestone in and of itself. Upon analysis, Environmental Defense Fund (EDF) sees the DRPs as a considerable step in the right direction. However, there are aspects of the plans we think could be improved to ensure California’s electric grid is able to take full advantage of already existing and future distributed energy resources. DRPs include proposed methodologies on how to incorporate clean, distributed energy resources into their business models. In addition, the proposals outline implementation frameworks for each utility’s five demonstration pilots ordered by the California Public Utilities Commission (CPUC). The plans include a directive for the market to dictate which technology solutions provide the greatest value to all customers and drive innovation. Finally, they emphasize the need for continuing electricity rate reform to create a distribution system usable by both service providers and customers. But the utilities’ plans could do more to fully embrace the potential of DRPs and transform California’s energy system. These plans could, for example, help utilities create a more dynamic electric distribution system – one that allows for greater levels of renewables while creating new revenue streams. This new system could be capable of knowing where and when these clean, distributed energy resources would be most valuable for the grid and encourage Californians and third parties to invest in them. What’s more, DRPs have the potential to help maintain grid reliability, improve resiliency, increase access to clean technologies, and decrease the use of polluting generation resources. Integrate more renewables. As California works towards ambitious climate and clean energy goals, more renewable energy resources are increasingly vital. These plans are one way California utilities can ensure they are prepared to utilize all the clean energy resources that are currently connected to the electric grid, as well as future resources. Align with market conditions. The utilities should strive to create a distribution system that operates as close to market conditions as possible. More and more Californians are starting to produce their own electricity – a core component of the clean energy economy. These customers should have an opportunity to buy and sell electricity in the competitive energy market place in the same way a natural gas power plant would sell its electricity to a utility for distribution to customers. By allowing customers and third parties to make money in this same market, we can further incentivize non-utility players to provide clean, renewable, affordable electricity to the grid. Open access to data. The two previous points can only be possible with open access to energy data. It is the glue needed to hold this new two-way, clean, distributed system together. While the plans contain more data than previously released about the distribution system, it leaves some important data out. Without more detailed data, utilities have the potential to block out third party participation – groups that are eager to provide distributed energy resources. Facilitate innovative product design. The pilot program proposals offered by the utilities uniformly identify the importance of adopting performance metrics, and allude to the need for new business models. However, with the exception of one utility, no specifics are included. SDG&E goes beyond the Commission’s guidance to include a sixth proposal focused on examining new business models and opportunities for creating additional revenue streams based on innovative product design. The utility’s “Bring Your Own Battery” (BYOB) model rides the trend of customers bringing their own batteries to the grid, and creates a role for the utility to facilitate this process. It is innovative new ideas like this one that show potential for transitioning to a cleaner, more distributed energy system while maintaining an active and vital role for utilities. As we know, the first step is the hardest when adopting a new paradigm and much work lies ahead as California’s largest utilities move into the implementation phase of their DRPs. Meanwhile, the goal of developing a performance-based framework that rewards utilities and customers for integrating clean, reliable, affordable energy solutions is now in sight. This entry was posted in Clean Energy, General, Grid Modernization. Bookmark the permalink. Both comments and trackbacks are currently closed.